Warranty coverage for products produced by another manufacturer is limited to warranty offered by that manufacturer. 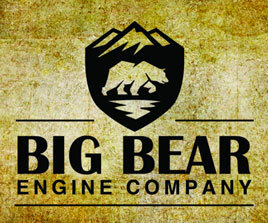 Big Bear Engine Company strongly recommends that certain parts be replaced in the remanufacturing process. Any deviation from our recommended procedures can be made at dealer’s request; however, warranty coverage for components which are not fully remanufactured according to Big Bear Engine Company standards is limited to the dollar value of the original invoice for a period of six months from the date of first installation. 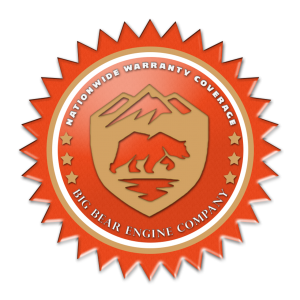 Big Bear Engine Company warrants its remanufactured products to be free from defects in material or workmanship and provides a warranty that includes 12 months unlimited miles of which the first 6 months will include parts and labor. The second 6 months will include replacement parts or components either new or remanufactured to OEM specifications. For its remanufactured parts and components, Big Bear Engine Company will pay for all parts and labor needed to repair the warranted failure to the functioning condition existing immediately prior to the failure. Labor will be paid in accordance to the published flat rate times to a maximum of $30 per hour. No premium, overtime, or holiday rates will be allowed. Only Big Bear Engine Company approved parts will be used in making the repair. Big Bear Engine Company will pay for the lubricating oil, antifreeze and filter elements that are not reusable due to warranted failure. Unless otherwise stated in the limited warranty contained in literature that is shipped with any product (in which case such product literature limited warranty will apply), Seller warrants to Buyer that the products sold by Seller to Buyer will be free from defects in design, workmanship and materials under normal use for a period of one (1) year after the date of shipment by Seller. Products may be returned to Seller only in accordance with the Warranty Claim Procedure. Upon a verified breach of the foregoing limited warranties, Seller will, at its sole option, repair or replace the defective product. Any defective product that is repaired or replaced is warranted only for the balance of the initial warranty period. Notwithstanding the foregoing, Seller does not warrant, and such limited warranty will be null and void, if any product fails to perform or is defective because of accident, casualty, misuse, abuse, alteration, Act of God or public enemy, vandalism, tampering or because of improper setup, operation, repair, maintenance, testing or unauthorized service. THIS LIMITED WARRANTY IS MADE IN LIEU OF ALL OTHER WARRANTIES, EXPRESS OR IMPLIED, INCLUDING WITHOUT LIMITATION WARRANTIES OR MERCHANTABILITY OR FITNESS FOR A PARTICULAR PURPOSE. (1) Copies of all work orders and receipts for all parts used in the original/installation. (3) Copies of all work orders and receipts for all parts used for the repair of the failure. (4) A completed warranty claim form. Give as much detail as possible, including a description of the operating system prior to failure. Warranty material must be sent to Big Bear Engine Company freight prepaid. If the claim is accepted, the freight charges will be credited back to the dealer. Do not combine warranty material and core shipments and do not list more than one failure per claim form. Parts involved and claims become the property of Big Bear Engine Company upon acceptance of the claim settlement. For denied claims, parts will be returned to the dealer at his expense if requested within thirty (30) days. In order for warranty claims to be processed, failed parts must be returned within (15) days of initial claim filing or claim will be denied.